We had our Halloween shindig today, and it was my first. Last year I was sick for Halloween and stayed home, but this year I got to experience the full awesome craziness. Here are some photos. My school is a green school, and we do lots of environmental programming to support the mission of our building (which was brand new 3 years ago). 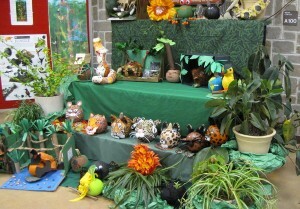 This year we’re doing a school-wide rainforest program across all subjects and grades, and the class pumpkin decorating contest this year had to be a rainforest creature/plant. These are the results, and they are the coolest pumpkins I have ever seen. 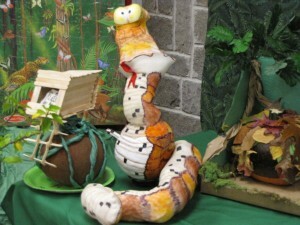 One of the winners was this genius snake from our 2nd/3rd grade deaf (AI) class. 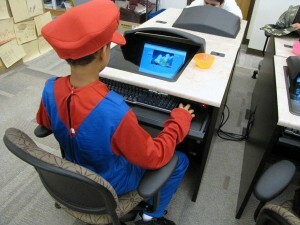 Does Nintendo know Mario is unfaithful to their games? A 4th grader planning his escape with library resources. Savvy. 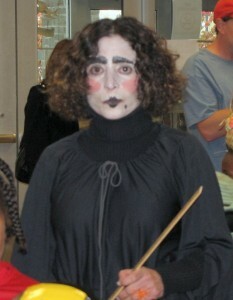 Viola Swamp visits our school every Halloween when a certain teacher is always “absent.” The kids are scared to death of her, and this teacher stays in character all day long. Brilliant. 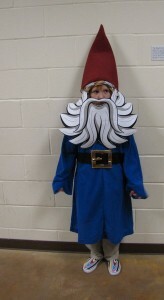 The Travelocity Roaming Gnome. They can’t buy better product placement. 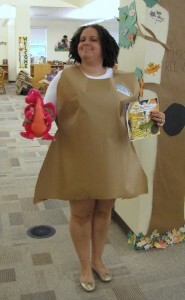 One of my favorite costumes of the day. 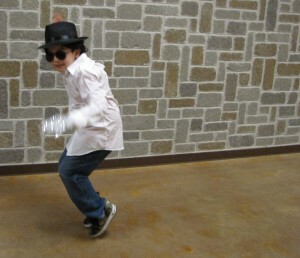 There was at least one Michael Jackson in every class this year, it was fascinating to see the cultural shift regarding him.